The Color Variations command in Photoshop Elements is a digital color-correction feature. 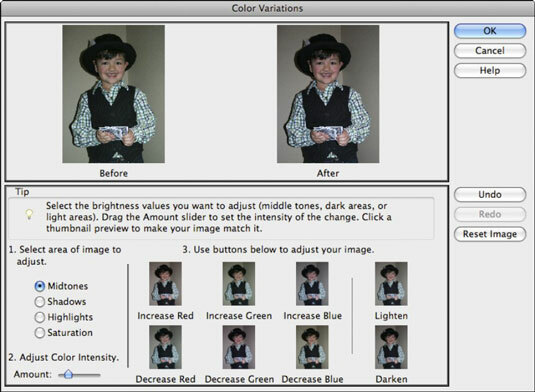 The command enables you to make corrections by visually comparing thumbnails of color variations of your image. You may use this command when you’re not quite sure what’s wrong with the color or what kind of colorcast your image has. Choose Enhance→Adjust Color→Color Variations in Edit Full or Edit Quick mode. The Color Variations dialog box appears, displaying a preview of your original image (before) and the corrected image (after). Color Variations enables you to visually correct your images by comparing thumbnails. Shadows, Midtones, Highlights: Adjusts the dark, middle, or light areas in the image, respectively. Saturation: Adjusts the color intensity or richness, making colors more intense (saturated) or less intense (desaturated). If your image is faded from time, be sure to increase the saturation after you correct any colorcast issues. Usually, just correcting the midtones is enough to get your image’s color in order, but if it’s not, you can always adjust the shadows and highlights, as well. Specify how much adjustment you want with the Adjust Color Intensity slider. Drag left to decrease the amount of adjustment and drag right to increase the amount. If you selected Midtones, Shadows, or Highlights in Step 2, adjust the color by clicking the various Increase or Decrease Color buttons. Click more than once if your initial application wasn’t sufficient to correct the problem. Be sure to keep an eye on the After thumbnail, which reflects your corrections while you make them. Click the Darken or Lighten buttons to make the colors a little darker or lighter, respectively. If you selected Saturation in Step 2, click the Less Saturation or More Saturation buttons. If you make a mistake, click the Undo button. The Color Variations dialog box supports multiple levels of undo. If you botch something, you can always click the Reset Image button to start again. Keep in mind that you can’t undo the Reset Image command after you click it. Click Cancel to bail entirely. To apply your color adjustments and close the dialog box, click OK. The Color Variations command is a great tool to correct those old, faded, green- (or some other unwanted color) tinted circa yesteryear photos. The Color Variations command allows you to easily correct the color and saturation of these precious, but damaged, images. Remember to either decrease the offending color or add the color that’s the opposite of the cast in the image.